In my book this is good news as in 14 years of riding I haven’t once used a parking light deliberately. I’ve accidentally used one on plenty of occasions, leaving the battery going flat. A year with no fear of a flat battery? I’ll take that. I’ve had bikes where the toolkit consists of one allen key. KTM are clearly cut from a different cloth, with an orange pouch stuffed full of decent quality tools. There’s even a bottle opener in there. A bloody bottle opener! That one inclusion makes me want to go camping just so I can use my KTM opener. At first, I thought KTM had omitted one important item as it looked as though I needed a 6mm allen key to adjust the shock preload, and there isn’t one in the kit. Turns out the star-shaped Torx key is the right tool for the job. When my partner Charlie’s Street Triple R decided not to restart after a hold-up at a level crossing, she had no option but to get a lift home on the back of the 1050. 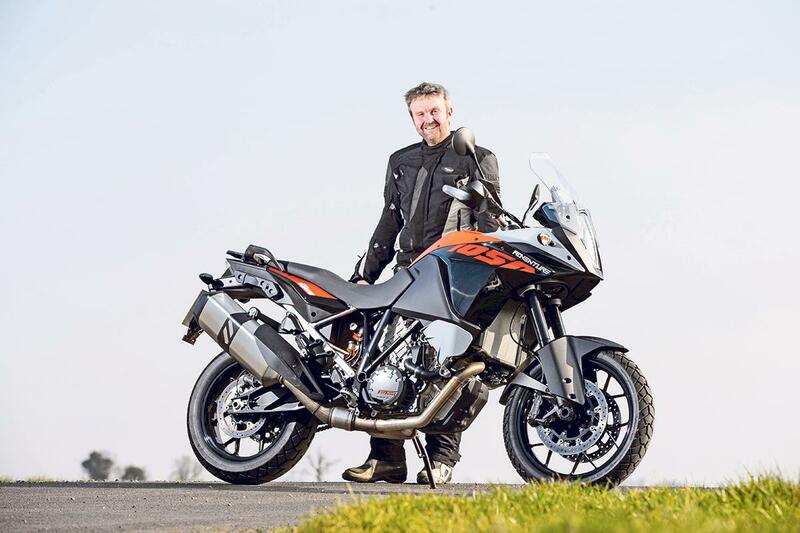 Charlie’s covered thousands of miles on the back of adventure bikes with continental jaunts on a Versys 1000, Multistrada and a R1200GS – and she gave the 1050 a good review. The back seat is comfier than it looks, there’s plenty of room for her feet, she can see the mirrors and clocks for interest and the grabrails are clear of the seat by enough of a distance to actually grab them. With a full tank it promises me 320 miles before it’ll need another drink. It holds onto that promise for a good while, then steadily reduces expectations. After 170 miles it’s reduced its promise to 60 miles before a pump is required. But when it hits 175 miles it suddenly trades Bob Marley mellow for Prodigy panic, flashing up a prominent ‘low fuel’ warning. I soon stop and give it 18.82 litres, meaning it’s covered 185 miles at 44.63mpg. If the spec sheet is right there are another four litres of fuel in there, which gives a theoretical range of 226 miles before empty. Pretty handy, but hardly 320 miles! When trying a bit harder on bumpy back roads the suspension at both ends starts to protest. As the bike’s still running in, that suits me at the moment. But I’ll soon be getting busy with the adjusters.